A warm, free-breathing jacket, The North Face Gordon Lyons Full Zip Fleece keeps you stylish on the trail. This shirt is made from a heavyweight sweater-knit fleece that has a great look and feel. It is brushed at the back for extra softness. Hand and chest pockets keep your belongings secure behind zippers. 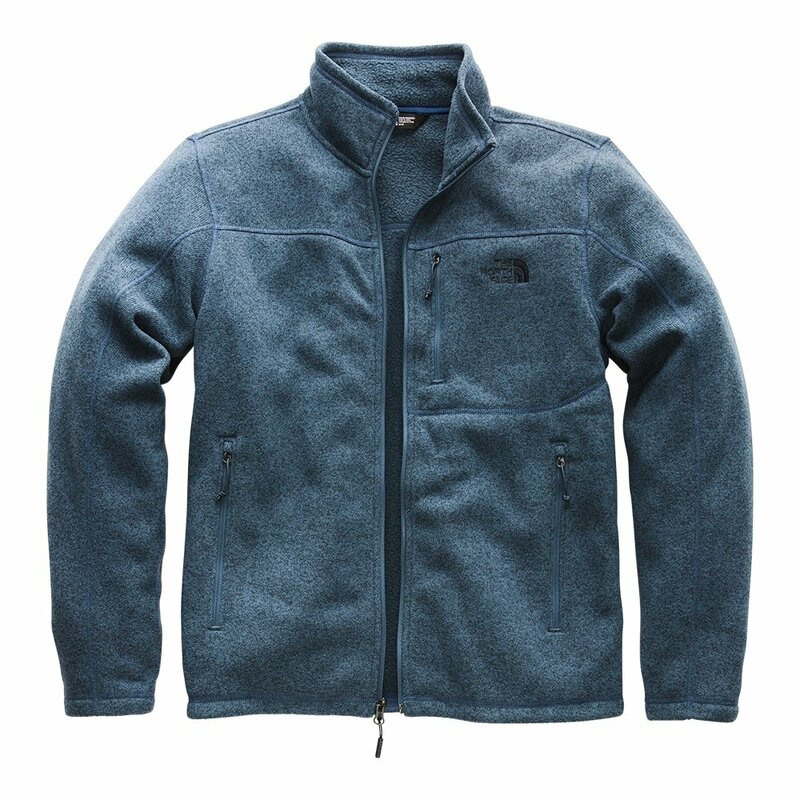 I bought this jacket for my husband and it's a great light jacket that's a little dressier than a regular fleece, making it more office appropriate. He normally wears a large, so I initially ordered it in that size, but ended up having to exchange for a medium. I would suggest going a size down for the best fit. I bought this for my brother, since he wanted a lightweight jacket similar to one his son has (which is North Face), but with a hood. After much research, this seemed to fit the bill. However, here are the issues. #1 Online it looked almost gray with a hint of green. In reality it's quite green (a nice green, but not like pictured. It might be my monitor, though). #2 Online the outside looked smooth, as if there'd be some type of water resistance in a light mist or snow. However, it is knit, like a sweater. #3 I ordered a Large, which my brother has worn forever. He's about 5'11", maybe 170. All I know is he's always been a men's large and he doesn't wear his clothes snug. He has not gained weight, either, although now he's freaked out and will probably be dieting or some craziness. This jacket is snug on him with a t-shirt on. No room for any bulkier clothing. It does look nice, but it's not what we were looking for so I'll be returning it. Hoping that the return process is easy. My Absolutely Favorite "Go to Hoodies!" The Gordon Lyons hoodie came to the rescue when I took a business trip to Boston 2 weeks ago. Boston just got slammed with a series of snow storms and windy conditions. The hoodie was the perfect mid laying garment as well as a great airport security go through. The zippered pockets were very handy. Wear it every day and really like it. Have a few 1/4 zip gordon Lyons sweater and really liked them. Really pleased with the hooded full zip. it was pretty nice. my momma got it for me. Nice warm jacket. Love the color. Love it. Should have bought 2 I live it so much. Looks great, feels even better. Love this jacket. Super comfortable and so soft. This is my favorite NF jacket ever. I want to buy another one in a different color just to have 2! Jacket came apart at the seam after three weeks. Customer service no help. Advises it will be repaired. I purchased this jacket for my dad for Christmas and he LOVES it. He especially loves the large chest pocket and the fact that the jacket is warm but not too bulky! Very comfortable and classic casual wear. My husband uses it casually but loves the look and feel. I got 2 of these for my boyfriend in blue and tan love them! I also got the plaid wuarter zip lyons jacket snd its his favorite one to wear! Wanted something a little different and more stylish than another fleece jacket that still did the job a jacket is supposed to do. This one has a great, clean look, is light weight and is pretty warm - even in December in Minnesota. Movement in it is non-restricting and you can layer up underneath this with no problem. Really happy with it. Quality is great. Great looking jacket. This is a Xmas gift. I love this material and look. Very stylish for both cozy wear and a business casual wear. It's very warm considering how lightweight it is. It's a really nice everyday jacket. It is suitable to wear for any occasion in Chicago's cool weather seasons.